ZipRealty offers sound advice and tips to sell your home in today’s real estate market. Since we know that making your home stand out, making sure it is as visually pleasing as possible, is an important part of selling your home, can you DIY this step, or should you hire a professional home stager? If you aren’t sure of what to do, contact a local home stager and have them create a written consultation report of what should be done. This will allow you to assess what items should be completed by a professional, and what items may be done DIY style. This may also help you save money by focusing on the things that are most important and will bring the biggest return on investment. 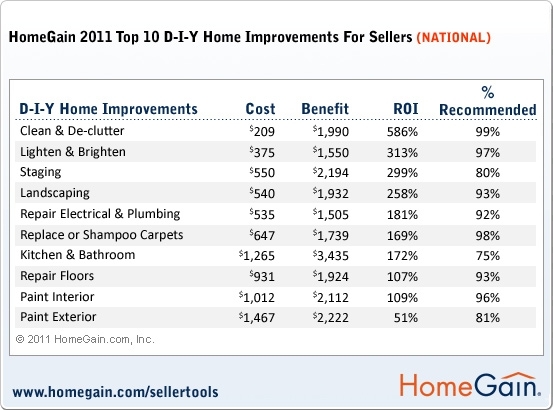 Speaking of return on investment, here are HomeGain’s top 10 home improvement projects when selling your home. I’m starting up a blog and could use a good perspective like yours… Would you consider doing a guest blog post? Sure Brock. Email me at marro.melissa@gmail.com and we can discuss it.